'Footfalls echo in the memory/ Down the passage which we did not take' T.S Eliot. The what if conundrum of Sliding Doors and the university to adult coming of age story like Starter for Ten and One Day combine in Laura Barnett's debut novel The Versions of Us. The lives of Eva and Jim are told from their first encounter at University aged only eighteen to their final days, and the novel is structured in three versions, depicting the life-altering effect of simple decisions, moments and happenings. Covering almost eighty years through the book from start to finish, themes of love, loss, heartbreak and passion are met and explored in a truthful and eloquent manner by Barnett. The setting hops from Cambridge, London and Bristol to Paris, Rome and New York. 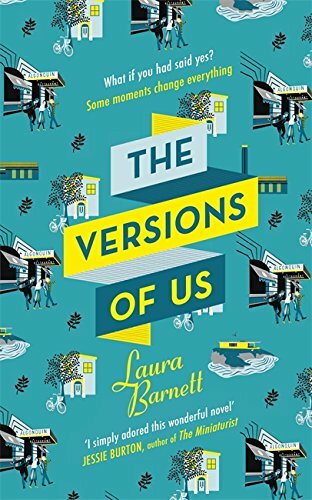 I love reading books that are set in places that I know and living very close to Cambridge and being able to picture the streets that Barnett describes brings an even more interesting reality to the book for me and has a very quintessentially English feel to the story from the word go. I did struggle with the three concurrent plots running through the novel; all with the same characters more or less, and jumping years and years ahead after one chapter is quite disorientating and makes it difficult to keep track of what 'version' you're reading (I think this is a common response to the book from the reviews I've read). This does detract from how well you get to know the peripheral characters but consequently does push Eva and Jim to the forefront - perhaps what the author intended. It isn't a book that I could dip in and out from, expecting to pick up exactly where I'd left off - sometimes you need to flick back a few pages/chapters to orientate yourself. I suppose there isn't really a way around this and probably requires a more concentrated read than I gave it (very guilty of skim-reading at times). Once I got over half way, I'd just about got to grips with who's who and it became a lot more enjoyable to read. I found Eva as a character extremely easy to like and sympathize with, whereas Jim was frustrating but an honest depiction of human reactions to emotions like rejection and feeling inadequate. The competing professions (writer and artist) added an interesting dimension to the tensions in their relationship and reminded me of Burton's novel The Muse. I did love the way that the concept of the novel materialized in the form of Jim's painting, the triptych canvas that shows three variations of a scene; 'the many roads not taken, the many lives not lived' which he titles The Versions of Us. It's quite unusual that books reference their title but I find it quite satisfying when they do. To me, there was no version that was preferable over another, they all had their own beauty and and tragedy in equal measure and I think that's quite a comforting message. I am one to ponder on the what if's but sometimes trusting in the universe is exactly what's needed to be happier and if the book teaches you anything, it is that happiness is fleeting and something to grasp on to. I find Barnett's subject matter provoking and inevitably incurs self-speculation, reflection and general pondering on how this projects onto your own life which is always a good sign. It strongly portrays the message that if something is meant to be, it will be in some way, shape, form or time regardless of the path you take. I know a lot of people have given up about half way through this book, but my advice would be to persevere until you find your rhythm with the different versions as it does get a lot easier and it is ultimately rewarding.